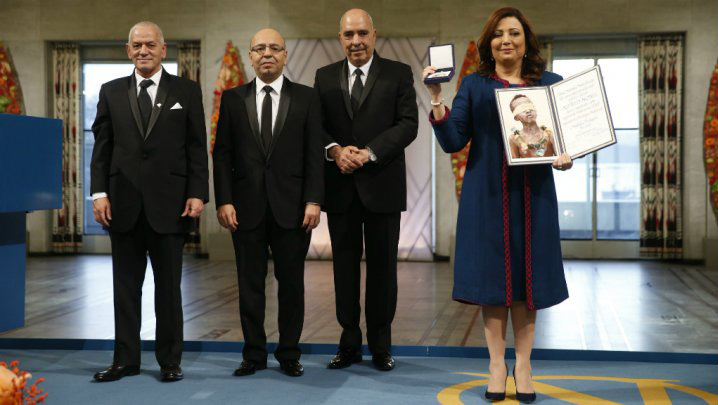 National Dialogue Quartet in #Tunisia wins #NobelPeacePrize for role in democratic transition. Praise #CivilSociety groups and individuals! The Tunisian Order of Lawyers (Ordre National des Avocats de Tunisie). It is a very good choice and it highlights the strong commitment of the Tunisian civil society in building the aftermath of the 2011 Revolution. Wided Bouchamaoui (UTICA), Hocine Abassi (UGTT), Abdessetar ben Moussa (LTDH) and Mohamed Fadhel Mahmoud (Ordre National des Avocats de Tunisie) are representing the quartet and they deserve this price for their hard work, congratulations for what their achievements!